The Africanized Honey Bee is a hybrid of one of the several European Honey Bee subspecies (Apis mellifera mellifera, A.m.carnica, A.m.caucasia, or A.m.linguica) and the African Honey Bee (Apis mellifera scutellata). The Africanized Honey Bee, more popularly known as the "killer" bee, has the general appearance of the more temperamental European Honey Bee (Apis mellifera). However, they are slightly smaller, but only microscopic measurements in a laboratory would be able to distinguish between the two. They are robust, 3/4 of an inch in length, and are covered in fuzz. They are brownish in color with black stripes that aren't as distinct as those on wasps or hornets. They have four clear wings that are attached to the thorax, which is the middle section of the body. The six legs are also attached to the bottom of the thorax. The abdomen is larger than the thorax and ends in the stinger, and the head is smaller than both of the sections. The two compound eyes are large and bulbous and allow the Africanized Honey Bee to see ultraviolet rays, enabling them to fly at night. The queens are the largest bees in the social structure, followed by the drones and then the workers. Africanized Honey Bees and European Honey Bees may be similar in appearance, but not in behavior. Africanized Honey Bees will attack when unprovoked, and they respond rapidly and in large numbers to disturbances that European Honey Bees would ignore. Like European Honey Bees, Africanized Honey Bees can sting only once; they deliver a venom identical to that of European Honey Bees. Both types of bee die shortly after leaving their stings and ends of their abdomen in their victim. The ancestors of the Africanized Honey Bee live throughout Europe and Africa, south of the Sahara Desert. The Africanized Honey Bee has spread over South and Central America through Mexico and into the United States. Africanized Honey Bees continue the northward expansion of their territories by swarming, the process by which bee colonies replicate. The spread rate has been about 200 miles a year. 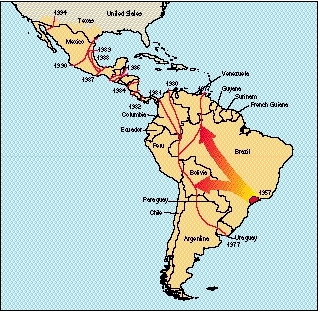 Africanized Honey Bees have gradually spread northward through South America, Central America, and eastern Mexico, progressing some 200 miles per year. In 1990, Africanized Honey Bees reached southern Texas, appeared in Arizona in 1993, and found their way to California in 1995. Honey bees are not native to the Western Hemisphere. European settlers brought most honey bees to the Americas approximately 400 years ago. However, European Honey Bees did not perform well in the tropical climate of South America. African Honey Bees were brought to the Western hemisphere in 1956, when the Brazilian government asked Dr. Warwick Kerr, a geneticist, to create a bee that could survive Brazil's tropical climate. The European Honey Bee had not been able to successfully withstand heat and predation. It was hoped that African Honey Bees, having proved themselves successful for millions of years in the tropics, could bred with the European bee. The goal was to create a bee which was gentle, yet successful in the tropics. However, in 1957, some of them got loose and set up housekeeping in the tropics of Brazil. They've been spreading ever since. Africanized colonies can increase their colony populations extremely quickly, but only in response to immediate availability of resources. The rapid expansion is obtained by high fecundity and shorter development times. These characteristics indicate that Africanized honeybees have evolved to survive and thrive in unpredictable conditions. Because rainfall determines the availability and abundance of flora and food sources, the unpredictable rainfall in the tropics creates unpredictable availability of resources for bees. Therefore, Africanized bees' foraging stresses this unreliability and results in a more opportunistic bee. The bees forage, store their resources, and increase their chances of survival by collecting more pollen, committing more of their foraging cohort to pollen collecting, and swarming more often to areas of higher resources. Africanized bees might forage individually, shift their foraging from intensive and collective to gleaning, or searching of relevant resources individually, bit by bit. Because of this adaptability to unpredictable resources, the Africanized honeybee is categorized as an r-selected species. This means that they discover their habitat quickly, disperse readily to find other habitats if and/or when their current habitat has become inhabitable, use resources quickly and efficiently, and reproduce rapidly. exploiting new habitats very quickly and is not particular about its nesting site. Competition among nectar- and pollen-feeding invertebrate pollinators and resource partitioning are affected by introduced Africanized Honey Bees. When Africanized Honey Bees compete with other species of honey bees for flowers, the Africanized bees may displace the other bees from the food sources. While over a short period of time, the abundance of other species of bee decreases and colony nectar and pollen harvest decreases, Africanized honeybees are negatively affected slightly over long periods. Competition is considered among one of the factors that are responsible for differences in foraging behavior and specialization in bees. Africanized Honey Bees have similar predators as all other bees. Their most destructive predators are humans. Africanized honeybees are preyed on by ants, anteaters, and armadillos. Honey badgers, safari ants, bee wolves, and bears are also major predators. Additionally, predation causes disturbances that could affect swarming and absconding. If a colony has just settled and predation causes a disturbance, the colony might be forced to relocate immediately, affecting colony size and growth rates. Bees defend their nests from predators by biting or stinging. Africanized bees pursue their predatory intruders for much longer distances than European honeybees. Additionally, parasites such as mites, fungi, and bacteria are supported by Africanized Honey Bees. Although Africanized bees are subject to the same diseases and mites that European bees are, Africanized bees have different biological processes and behaviors that affect the importance and visibility of the diseases and mites. Africanized honeybees in the tropics directly influence 25-30% of the reproductive success of the flora. The flora depends on the bees for pollination, and in turn, flora provide seeds and fruit for their own reproductive success and as food for other organisms. There are two views about the influences that Africanized Honey Bees have on crops. Pollination of crops can continue even if an area has been fully colonized by Africanized bees. The first argument contends that farmers' costs to produce crops increases because of the required public protection from Africanized bees and the increasing costs of purchasing European Honey Bees for pollination. The other view argues that Africanized honeybees are better pollinators than European honeybees because they emphasize brood rearing and colony growth instead of honey production. The shift in resource management allows Africanized honeybees to forage more for pollen than European bees. Therefore, Africanized bees can be regarded as superior pollinators. In Sinaloa Mexico, Africanized honeybees have invaded the area but have not caused any problems in crop harvests and production. Africanized Honey Bees are dangerous because they attack intruders in numbers much greater than European Honey Bees. Since their introduction into Brazil, they have killed some 1,000 humans, with victims receiving ten times as many stings than from the European strain. They react to disturbances ten times faster than European Honey Bees, and will chase a person a quarter of a mile. Other concerns with Africanized Honey Bees are the effects on the honey industry (with an annual value of $140 million dollars) and general pollination of orchards and field crops (with an annual value of $10 billion dollars). Interbred colonies of European and Africanized honey bees may be more aggressive, excessively abandon the nest, and not survive the winters. Further, beekeepers may not continue their business of honey production if faced with aggressive bees. The packaged bee and queen rearing industries are in the southern United States, which would affect the honey industry across the continent. Additionally, several researchers have shown that native solitary and social bee species are outcompeted by the introduced Honey Bee. It is possible that many species of native bees have or will go extinct as a consequence of the ecological dominance of these introduced bees. Diagnosing a control level depends on the environmental conditions. As Africanized bees expand into temperate areas, their tropical adaptations are less advantageous. Africanized Honey Bee populations in temperate regions would not successfully establish a domain and therefore, a "Minimal Priority" control level should be diagnosed. However, a "Medium Priority" control level for North America's southern semitropical area is recommended. For example, in Argentina, Africanized bees dominate in the northern semitropical regions, but European bees dominate in the southern temperate area; in-between, there are hybrid zones where bees have varying degrees of African or European traits. A similar pattern may occur in the United States, with African traits dominating in extreme southern regions. Even though the ecological range limits and economic consequences of the African Honey Bee migration into the United States are not precisely known, specialists agree that honey bees are economically important, and that sufficient biological information exists to develop adequate inventory and monitoring programs. Added benefits to honey bee monitoring programs are also important because bee colonies can also serve as excellent indicators of flowering plant productivity, ecosystem stability, and relative ecological health. Because it will be more informed about the African Honey Bee, the U.S. beekeeping industry is not expected to suffer extensive damage from the invasion. It is anticipated that beekeepers will attempt to maintain European stock by drone-flooding, which involves maintaining large numbers of common European Honey Bees in areas where commercially-reared queen bees mate. This process would limit the mating possibilities between Africanized drones and European queens. Another strategy is frequent re-queening, where the beekeeper replaces the queen of the colony, thus assuring that the queens are European Honey Bees and that mating has also occurred with European drones. In addition, beekeepers will probably become involved in exterminating wild bee nests to protect their managed bees from resource competition. Finally, the public should maintain a healthy respect for all bee colonies and swarms. 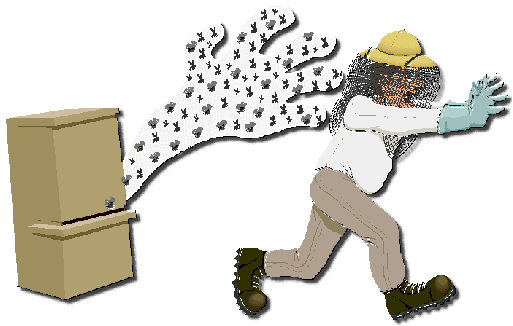 Any wild swarms found near residences or close to domestic animals (horses, cows, poultry, hogs, and dogs) must be suspect and reported to pest control operators, police, fire departments, and/or beekeepers. In all cases, the people who received the multiple stings, survived. Since the bees are potentially dangerous, people need to be aware that they are out there. The public already is exposed to yellow jackets and small wasps that are just as defensive as the Africanized Honey Bee’s. Therefore, killer bees are not so scary. Just stay away from bee hives. The bees will "never go away" nor can they be completely exterminated. Bees are responsible for the life of our trees, flowers and the food we eat. At least one meal per person per day is possible because of the bee. Therefore, learning about the Africanized Honey Bees and taking certain precautions can lower the risk of being injured by this new insect in our environment. Sheppard, Walter S., Rinderer, Thomas E., Mazzoli, Julio A., Stelzer, J. Anthony, and Shimanuki, Hachiro. "Gene flow between African- and European-derived honey bee populations in Argentina." Nature 349 ( Feb 28, 1991): 782-784. Rinderer, Thomas E., Oldroyd, Benjamin P., and Sheppard, Walter S. "Africanized Bees in the U.S." Scientific American 269 (Dec 1993): 84-90. Camazine, Scott, and Morse, Robert A. "The Africanized Honeybee." American Scientist 76 (Sept/Oct 1988): 465-471. Rinderer, T.E., and Collins, A.M. "Foraging Behavior and Honey Production." The "Africanized" Honey Bee. Eds. Spivak, M., Fletcher, D.J.C., and Brees, M.C. San Francisco, CA: Westview Press. 1991. 235-257. Potter, Anthony. The Killer Bees. New York, NY: Grosset and Dunlap. 1997. Roubik, David W. Ecology and Natural History of Tropical Bees. New York, NY: Cambridge University Press. 1989. Sheppard, W.S., and Huettel, M.D. "Biochemical genetic markers, intraspecific variation, and population genetics of the honey bee, Apis mellifera. Africanized Honey Bees and Bee Mites. Eds. Neadham, G.R., Page, R.E., Delfinado-Baker, M., and Bowman, C.E. Chichester, England: Ellis Norwood Limited. 1988. 281-286. Merrill, Laura D., and Visscher, P. Kirk. "Africanized honey bees: a new challenge for fire managers." University of California, Riverside. 25 Feb. 2001. http://bees/ucr/edu/ firenotes/html. Fletcher, D.J.C. "Interdependence of Genetics and Ecology in a Solution to the Africanized Bee Problem." The "Africanized" Honey Bee. Eds. Spivak, M., Fletcher, D.J.C., and Brees, M.C. San Francisco, CA: Westview Press. 1991. 77-94. Winston, M.L. "The Inside Story: Internal Colony Dynamics of Africanized Bees." The "Africanized" Honey Bee. Eds. Spivak, M., Fletcher, D.J.C., and Brees, M.C. San Francisco, CA: Westview Press. 1991. 201-212. Roubik, D.W. "Aspects of Africanized Honey Bee Ecology in Tropical America." The "Africanized" Honey Bee. Eds. Spivak, M., Fletcher, D.J.C., and Brees, M.C. San Francisco, CA: Westview Press. 1991. 259-281. Smianuki, H., Knox, D.S., and De Jong, D. "Bee Diseases, Parasites, and Pests." The "Africanized" Honey Bee. Eds. Spivak, M., Fletcher, D.J.C., and Brees, M.C. San Francisco, CA: Westview Press. 1991. 283-296. Roubik, D.W. "An overview of Africanized honey-bee populations: reproduction, diet, and competition." Africanized Honey Bees and Bee Mites. Eds. Neadham, G.R., Page, R.E., Delfinado-Baker, M., and Bowman, C.E. Chichester, England: Ellis Norwood Limited. 1988. 45-54. Ratnieks, Francis and Visscher, P. Kirk. "Agricultural Impact of Africanized Honey Bees in Sinaloa, Mexico." University of California, Riverside. "Africanized Honey Bees." The Texas A&M University Agriculture Program. http://agnews.tamu.edu/bees/ . 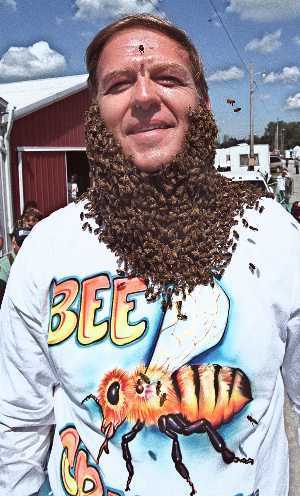 "Africanized Honey Bee," Microsoft® Encarta® Online Encyclopedia 2000. http://encarta.msn.com © 1997-2000 Microsoft Corporation. All rights reserved. Koning, Ross E. "Honeybee Biology." Plant Physiology Website. 1994. http://koning.ecsu.ctstateu.edu/plants_human/bees/bees.html.